For the longest time I have been wanting to find a news reader that would show the discussion inspired by a blog post, and today I finally found one. A little while ago a reader tipped me to BazQux Reader, and I have to thank Guillaume for really making my day. This browser-only news reader does something that I have not seen before; it offers the option of fetching the comment feeds for any RSS feeds you follow and integrates the comments with the respective posts. I'm sure that most readers now that it is possible to subscribe to an RSS feed for the comments on a particular post, and that most blog platforms (WordPress, Blogspot, etc) have certain standard ways to offer the comment feeds. BazQux makes use of that standardization to find and display the comments. I'm still trying out Bazqux, but as you can see from the screen shot below it is clearly heavily influenced by Google Reader. This service offer multiple reading modes, including the compact mode that news junkies secretly desire, as well as a mosaic style layout which could be very useful for photoblogs. Bazqux also currently has other subtle features including the option of hiding feeds that don't have new content, several variations of how compact the list view can be, universal viewing modes (make all feeds shows as list, mosaic, etc), and an option for when and how to mark a post as read. Comments, now that's where things get interesting. They're optional, and the comments on a post won't be retrieved until you request them. That's an excellent compromise. This service even supports a number of keyboard shortcuts, including one that will send a full blog post to Readability so it can be saved for later. It doesn't have any mobile apps, but it does currently offer support for remote login from other mobile feed reader apps (Google Reader API required). You can even set a unique password and login ID, a feature that I deeply appreciate (my gmail login is 24 keystrokes long), but using Bazqux with those other apps will require those other developers choosing to add support for Bazqux. All in all I am impressed with what I see.I even imported my 2,000 plus feeds from Google Reader and Bazqux continued to function quite well. If this service already had mobile apps (and offered the translation feature I need) I would have already signed up. As it stands this is definitely a contender. I have even added it to my list of potential replacements. Bazqux has been under development since late 2011, and it launched in the middle of 2012. It appears to be a one man operation, and is the work of a Moscow-based developer named Vladimir Shabanov. Bazqux is only directly available in the web browser, and it's a freemium service. You can only use it for a month before being required to pay. The paid service costs $9, $19, 0r $29 a year, and the higher rates are entirely voluntary. Thanks for this! I was playing with it this morning and so far it wins in my Google Reader replacement search. I love that you can use spacebar to move down. I love the comments on the same screen. You can ignore a post with the letter i. 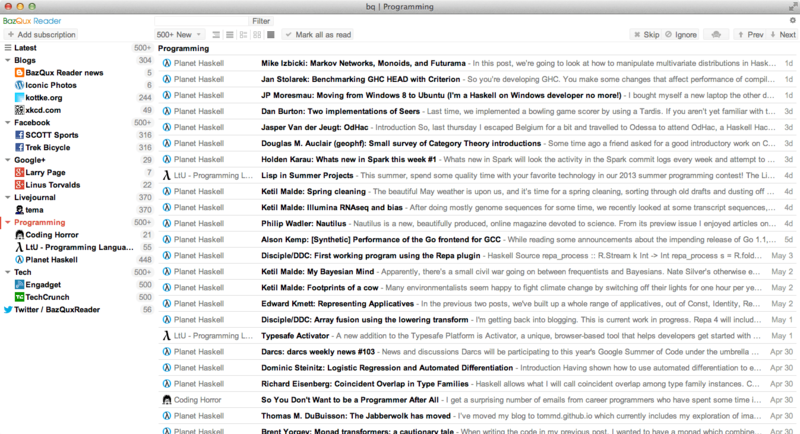 It imported my Google Reader stuff quite quickly and it’s easy to use. Now I just have to figure out how to add blogs to it. Thanks. Thanks for post! I’m developer of BazQux Reader. Hope mobile app developers will support BazQux. It’s very simple thing to do now, since API is Google Reader compatible. What do you mean by “translation feature”? Translation from other languages (something like integration of Google Translate in reader)? Good idea. Quite busy with other features at the moment but will definitely add this in future. Question for the developer – I noticed that Bazqux has given me a trial use of the program for 30 days, then wants either $9, $19, or $29. 2)What is the difference in the pricing tiers? 3)Why not go by a donation ? > Why would I pay for something that I can get free? Running servers and development costs money. Of course you can use free alternatives (Google Reader was one of them) but there is no guarantee that reader won’t close and no customer support. > What is the difference in the pricing tiers? No difference. It’s pay what you want deal. > Why not go by a donation ? Donation usually doesn’t work. Even Wikipedia have problems with donations. The more I use it, the more I appreciate being able do read the comments. I’m discovering I missed a lot of interesting things. As for mobile application, I just hope that they’ll do the work to display comments too. BazQux Reader is now supported by Feeddler Pro for iPhone, will be supported by Mr.Reader (iPad) next week and supported by beta android app News+ (https://groups.google.com/forum/#!topic/g_reader/fNwf_UvqpCQ). It’s good to have Google Reader compatible API. Do you know if these app would be able to sideload the comments, as on bazqux.com ? Probably they will. But not in the near future. App developers are very busy supporting various Google Reader replacements at the moment. 2. For some blogs some posts only came in the RSS.Is it possible to get all the posts for a blog in the Bazqux. 3. It’s issue with latest browsers does not allow by default to show http videos inside https site. Will fix soon by changing youtube links to https. The same issue for the “http://karundhel.com/” wordpress blog also. It has more than 100 post entries. But in the BazQux Reader less than 10 post entries only came. RSS feeds usually contain only last 10-20 posts. When you subscribing to new feed BazQux leaves only last 10 articles or articles from last month unread (like Google Reader did). This feed contains 10 posts and only 2 from last month. I want to read blogs all posts through BazQux reader only. Not through the site. Is is possible to implement this workaround in BazQux reader as like “Readability” button. Also is it possible to send a article to my Email ( Including the title & complete article). It only works for Blogspot. You’ll be able to read all the new posts in BazQux. It’s only older posts that can’t be read since they aren’t present in RSS feed. What kind of greasemonkey scripts do you want to be implemented? Only link and title could be send via e-mail. It’s probably possible to make more tight integration with GMail but there is no universal way to send whole article that will work with all e-mail providers.